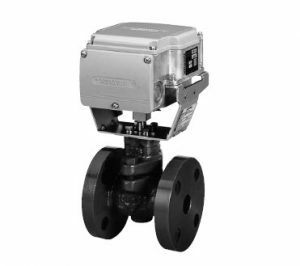 VY51 Series ACTIVAL Motorized Two-Way Valve. The VY51 series of ACTIVAL motorized two-way valves consists of rotary type motorized two-way valves with flange connections and valve sizes from DN15 to DN80 (1/2″ to 3″). The valve and actuator are integrated into a single unit. The valve can be used for the control of chilled/hot water and steam, and the valve body pressure rating complies with JIS10K. The actuator has a reversible synchronous motor, which operates a voltage of 24 Vac.